Poole & Kent Company of Florida (P&K) is a market leader in specialty general contracting with an emphasis on highly complex process mechanical, electrical generation, HVAC, plumbing, and refrigeration systems. Poole & Kent recently completed working on one of the largest deep-bed sand filtration systems in the United States – the focal point of a $628 million high-level disinfection (HLD) South District Wastewater Treatment Plant project in Miami. This project speaks to our depth of knowledge and experience in a field where projects containing 10+ milestones and multiple completion phases were required. Read about some of our past projects. 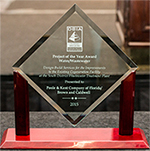 Poole & Kent Company of Florida Presented 2015 Design-Build Excellence Award. Read the press release. Poole & Kent Company of Florida has been awarded a contract to expand and upgrade the largest sewer plant in Palm Beach County. Read the press release. Poole & Kent Company of Florida recently completed the construction of the City of Clearwater’s WTP No. 2 Reverse Osmosis Plant Site Expansion project. The City celebrated the grand opening with a ribbon-cutting ceremony on June 4, 2015. Read more about the project here. If you would like to be notified of upcoming bids or projects, please complete this form and return to info@pkflorida.com to be added to Poole & Kent’s vendor database. Pride, hard work, and helping to keep our customers happy. Click the video above to look at 2018 as seen through the eyes of EMCOR Group employees. We were recently presented our third 1st Place Excellence in Safety Award from MCASF. Read our press release. Our Safety Director, Dave Lockhart, was named Safety Professional Of The Year for the third time in the past four years by CASF. Read our press release. Poole & Kent recently completed Miami-Dade Water and Sewer Department’s first plant process design-build project – Improvements to the existing Cogeneration Facility at the South District Wastewater Treatment Plant. The project included the complex installation of four new 2,000 kw cogeneration units and all ancillary systems in an operating facility. The project was completed safely, on schedule, and under budget. Read more about our design-build experience. The Florida Region of the Design Build Institute of America (DBIA) presented us with a 2015 Project of the Year Award - Water/Wastewater. This award was for the design-build services we provided for the improvements to the existing cogeneration facility at the South District Wastewater Treatment Plant. 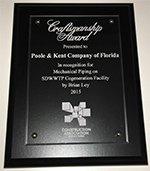 The Construction Association of South Florida (CASF) presented us with a 2015 Craftsmanship Award for Mechanical Pipingfor work we did to the existing cogeneration facility at the South District Wastewater Treatment Plant.